Clearly, I should always row in the daylight so I can see potential hazards! These days it seems like we only hear horrific news. The potential of war with North Korea, continued racial injustice, hostile and uncivil discourse. So it's easy for us to overlook random acts of generosity; when people go out of their way to help one another. I was reminded of inherent human kindness this morning. I was rowing west in the Lake Washington Ship Canal, heading toward the Ballard Locks. The skies were clear, but mornings are very dark in Seattle this time of year, and it was about an hour before sunrise. So, not all that easy to spot potential hazards. When you are in a rowing shell, you don't face the bow of the boat; you're looking back at the path you've taken. So you have to turn often to check the water ahead for obstacles. Unfortunately, in the dark, I didn't notice a large log that was partially submerged. Smack, I crashed into it at full speed. The real problem was that the log somehow wedged itself onto my boat's hull, snagged on the rudder I think. I couldn't free the boat myself, so I called out, repeatedly, for help. My fellow rowers didn't hear me, but somebody in a nearby marina did. A voice called out in the dark 'watch for the dinghy, we're coming!'" A small white boat putted out toward me, a smiling man named Justin at the helm. Actually, I didn't know his name was Justin at the time, I just know he maneuvered gently around my oars, trying to free my boat. Fellow rowers saw the situation and paddled over to help; one of them asked for Justin's name after he succeeded in freeing my rowing shell. Justin lives aboard a boat called the Argonaut, in a marina just east of the Ballard Locks in Seattle. He was asleep when I started yelling for help, but he answered my call. When I apologized for disturbing his sleep, he responded, 'that's what you were supposed to do.'" Justin, I made it almost all the way back to my boathouse, about a mile and half east of your marina. Unfortunately, the collision put a large hole in the bow of my shell, and I took on so much water the boat started to sink. I had to jump off and swim to the dock, with a fellow rower named Tom helping keep my spirits, if not my boat, afloat. In the grand scheme of things, a small boating collision isn't a catastrophe. But it might have been so much worse without Justin Who Lives Aboard the Argonaut, and Tom who called out to encourage me. We all do rely on the kindness of strangers. This morning reminded me how important those random acts of generosity can be. Pacific Northwest Ballet Principal Dancer Lesley Rausch in George Balanchine's "Diamonds"
Thanks for a wonderful time on opening night of George Balanchine's "Jewels." Oh, I know it took a group effort to kick off Pacific Northwest Ballet's new season with a brand new production to celebrate "Jewels'" 50th anniversary. And I really did like Jerome Kaplan's new sets and costumes, especially the fabulous tiaras. (By the way, what did you guys do with the old ones? I've been dropping hints to Santa, ever since the new production of "Nutcracker" with all the sparkly head wear, but so far, no tiara in my holiday stocking). Where was I? Oh, yes, I was telling you, Lesley, how much I enjoyed you in the "Diamonds" section of the evening. Before I get carried away, though, I do want to compliment the PNB orchestra, under Emil de Cou's baton. Faure! Stravinsky! Allen Dameron on piano! Tchaikovsky! Whew, what musicians! And your fellow dancers were pretty wonderful, too. 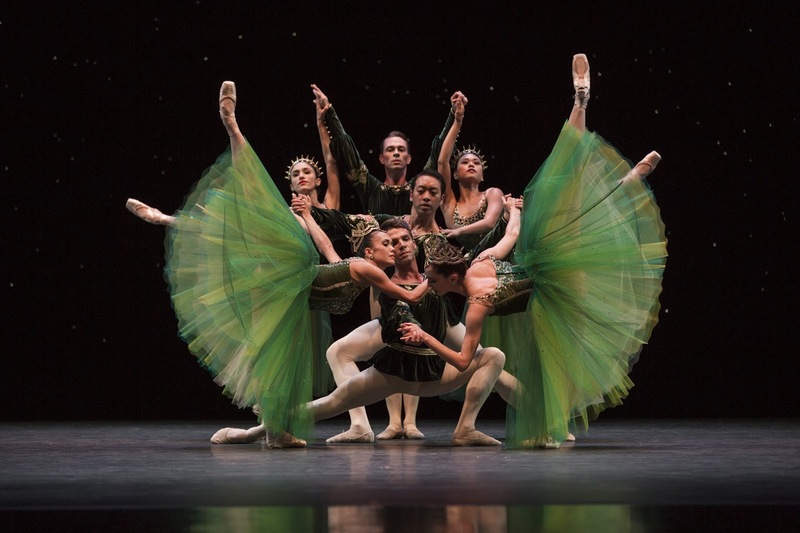 PNB Principal Dancers Noelani Pantastico and Lucien Postlewaite sizzle in George Balanchine's "Emeralds"
Half that opening night audience had come specifically to see Noelani Pantastico reunite with Lucien Postlewaite in "Emeralds." Hoo boy, they gave a little heat to that cool, elegant choreography. And three cheers for Sarah Ricard Orza, promoted to Principal Dancer at long last! I was also pretty stoked to see all-round talent Ezra Thomson get named Soloist. Oh, and Ben Griffiths and Rachel Foster were pretty saucy in "Rubies." PNB Principal Dancers Rachel Foster and Benjamin Griffiths in Balanchine's "Rubies"
But really, Lesley Rausch, when you came onstage with that tall drink of water Karel Cruz, well, be still my heart! You always look regal, you always nail the technique. But in this production of "Diamonds", girl, you had me in the palm of your hand. Every extension of your feet and hands, every spin you took, I felt like you opened your heart to us. You brought your authentic self to the stage and by doing so, you elevated your artistry to new heights. PNB Principal Dancers Karel Cruz and Lesley Rausch in Balanchine's "Diamonds"
Frankly, I've always been a "Rubies" fan, but Lesley, if you're dancing, "Diamonds" are this girl's new best friend. 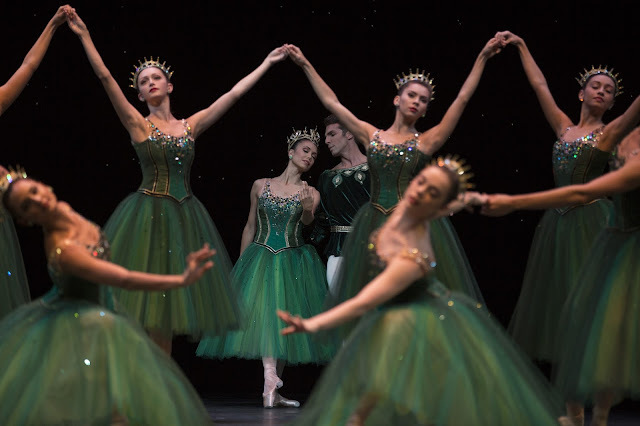 Pacific Northwest Ballet's new production of George Balanchine's "Jewels" continues through October 1 at McCaw Hall. 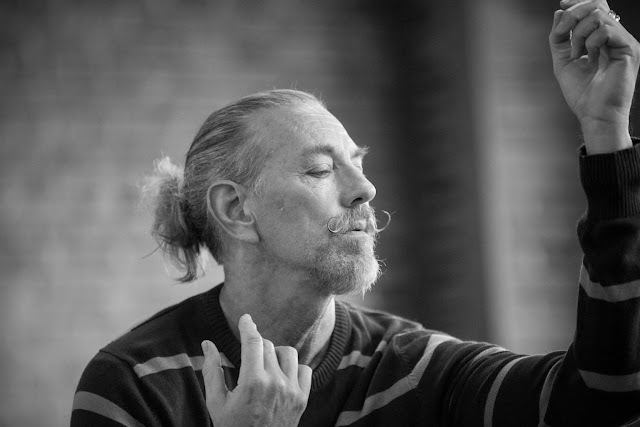 Wade Madsen in the studio, @Gregory Bartning, from "Beauty is Experience:Dancing 50 and Beyond"
The other day I met a friend for coffee and we got to talking about being older women in this culture. “Sometimes I feel invisible,” she said. I know exactly what she means. 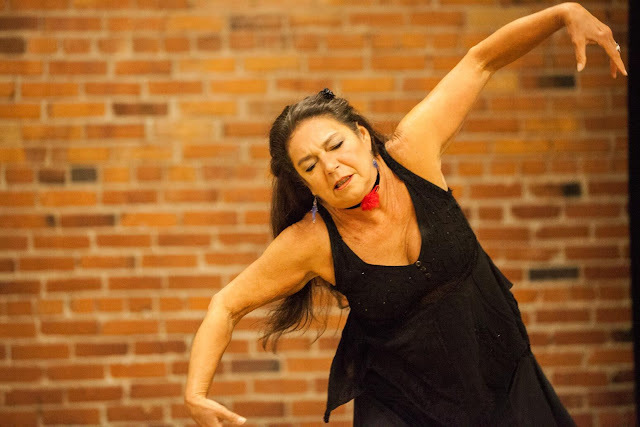 As we talked, I remembered something that struck me last spring, when Wade Madsen appeared in KT Niehoff’s “Before We Flew Like Birds, We Flew Like Clouds.” At one point, fairly late in the performance, Niehoff and Madsen sat down for a chat, and she asked him what it feels like to be an older dancer. I can’t remember his exact reply, but the gist was: awful. Then he said something that has stuck with me: a body in motion stays in motion. Keep moving, keep writing, keep following your heart. The older I get, the more life experience I garner, the more I feel that I’m ‘old fashioned,’ or out of step with the world around me. I know a hell of a lot more about the world now than I did when I started out as a journalist 35 years ago, but somehow I still feel like I am an impostor. 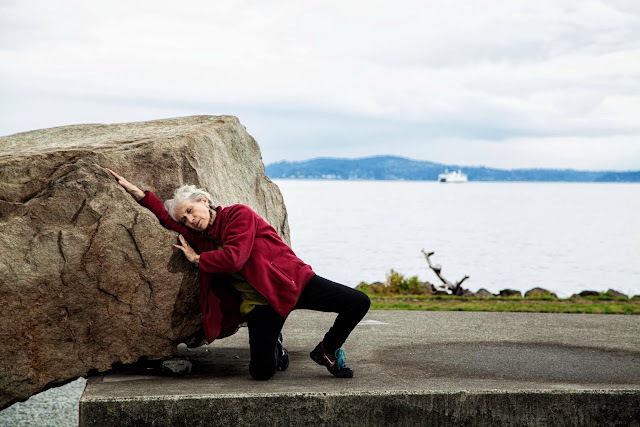 So I just keep plugging away and take huge inspiration from older artists, especially dancers, who imbue their work with all of their own life experience. So I was thrilled to get a copy of Emmaly Wiederholt and Gregory Bartning’s new book “Beauty is Experience: Dancing 50 and Beyond.” It’s a collection of short interviews and photographs of a number of older dancers talking about their career highlights, their limitations and their thoughts on their futures as dancers. Five Seattle artists are included in this book: Madsen, along with Mark Haim, Shirley Jenkins, Christian Swenson and Tara Stepenberg. The book doesn’t delve deep into the connections between aging and artistry; instead, those insights grow on you as you go through the many stories Wiederholt and Bartning include. Mark Haim cited a song that I totally relate to, Stephen Sondheim’s “I’m Still Here.” If you’re drawing a blank, find a version online, preferably performed by the inimitable Elaine Stritch. It’s an anthem to growing older and wiser, a musical flip of the bird to a folks who might discount us. I saw myself in something Shirley Jenkins told Wiederholt. “I battle the sense that people have put me out to pasture, or that I’m old school, or not what’s ‘in,’” Jenkins said. “That’s something I’m constantly fighting. But ultimately, this book is about the triumph of the creative spirit, and the joy these artists derive from dancing. It reminds me the take a deep breath whenever pessimism starts to drown me, that I live the life that passion drives me towards. Emmaly Wiederholt launches her book at Cornish College of the Arts’ Main Gallery this Sunday, September 24th from 5-7 p.m. You can find out more about the book at her website stanceondance.com. Whim W'Him dancers in Bruno Roque's "The Background Hum of Stimuli"
From its inception, Olivier Wevers’ contemporary dance troupe Whim W’Him has presented not only Wevers’ choreography, but work by a diverse collection of dance makers: Annabelle Lopez Ochoa, Penny Saunders, Mad Boots,Ihsan Rustem, to name just a few of the artists from outside the Pacific Northwest. It's been a real treat for dance fans. 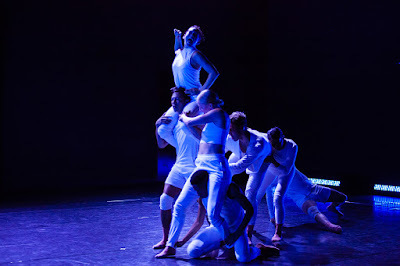 For the past three years, Wevers has empowered his company members to select the choreographers they want to work with for the annual production “Choreographic Shindig.” This year, they’ve outdone themselves; “Choreographic Shindig III” is an evening of stellar offerings. 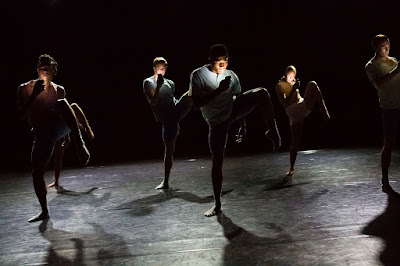 The program kicks off with Bruno Roque’s somewhat fanciful “The Background Hum of Stimuli.” The dancers appear on stage, lit only by their cell phone screens and directed by the ubiquitous Siri/Alexa robotic voice we’ve all come to know. 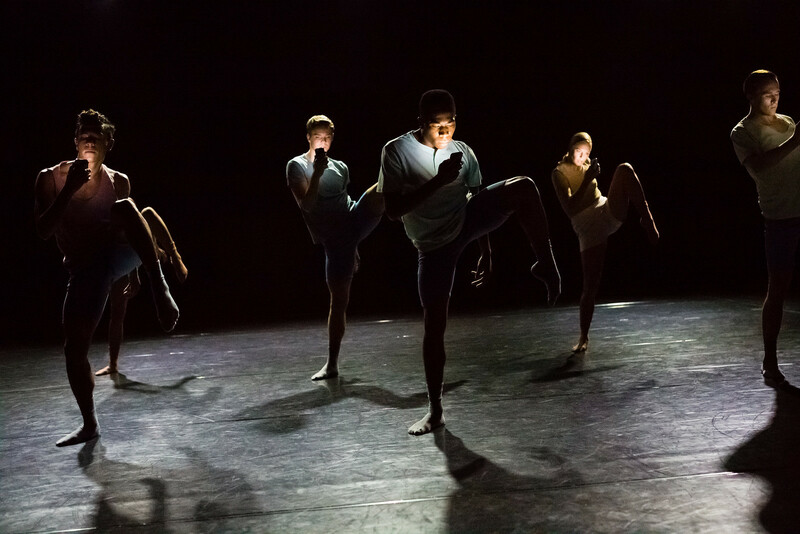 The dancers are engrossed in their individual electronic worlds until the voice forces them to set aside their devices and interact—with the audience and with one another. 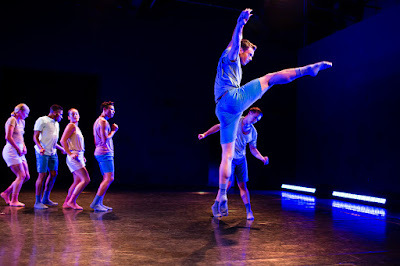 Whim W'Him dancers in Roque's "Background Hum of Stimuli"
What results is a physical embodiment of Art Blakey’s hypnotic music. The dancers step out of the group, one by one, to throw down solos the way Blakey’s Jazz Messengers riff on the musical composition. The result is pure joy. Adam Barruch’s “Summoning” is much quieter, a contemplative offering set to an original score by Roarke Menzies. It provides a chance for the excellent company members to shine. Karl Watson and Liane Aung in Adam Barruch's "Summoning"
Bouldin, an award-winning dancer and choreographer based in Tennessee, was diagnosed nine months ago with Multiple Sclerosis. That’s when she began this ongoing artistic project. 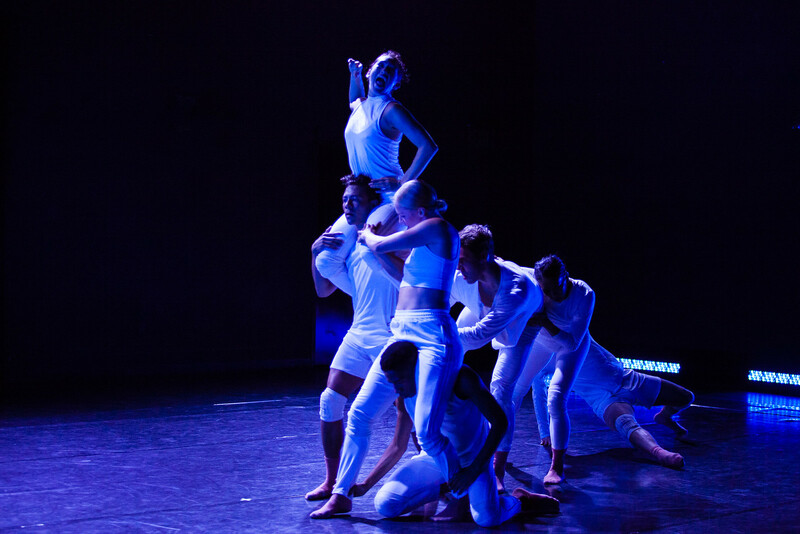 Whim W'Him dancers in Banning Bouldin's "Limitation Etudes: 7-10"
In Seattle, Bouldin collaborated with the company members to create four stunning, interconnected works that begin with a spectacular entrance. Liane Aung perches atop Jim Kent's shoulders, surrounded by four crouching figures. 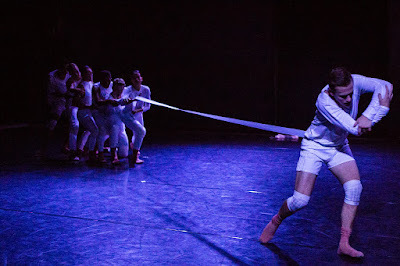 As they make their way slowly downstage, we see they are tethered together by what looks like a wide fabric bandage. The material is anchored to Karl Watson, who is frantically trying to escape its hold on him. Although our ties to one another can limit us, they can also lend support. Mia Monteabaro straddles Tory Peil, who literally helps Monteabaro move her feet across the floor. Their interdependency is replayed throughout these four sections. Each of Bouldin's etudes is infused with a sense of determination as well as melancholy. But this is no pity party; instead it’s a call for fearlessness in the face of what might seem insurmountable obstacles. 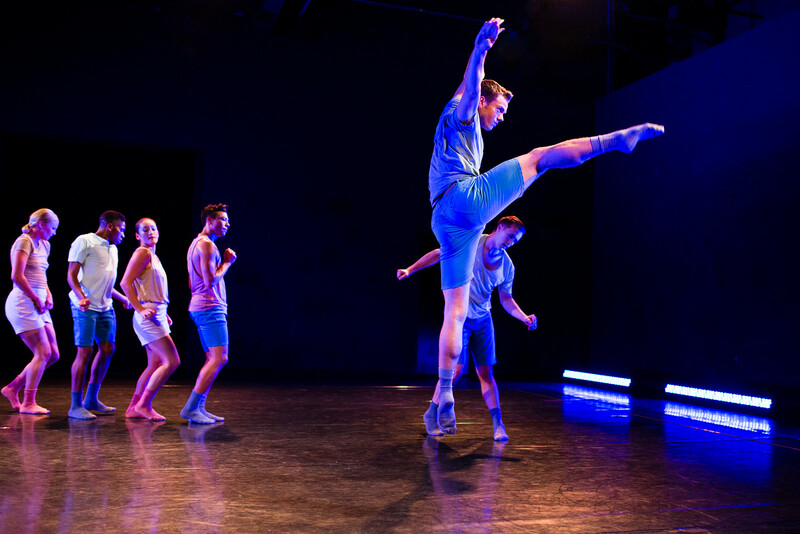 Bouldin’s choreography, both technically complex and emotionally resonant, packs a universal punch that transcends the personal circumstances that spawned it. 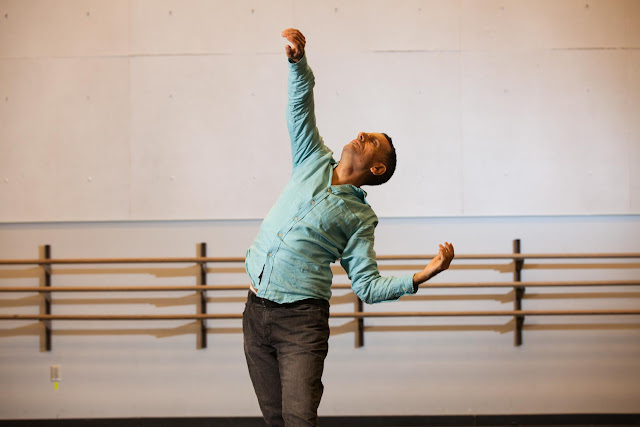 Karl Watson and Liane Aung in Banning Bouldin's "Limitation Etudes"
For the past seven years, Olivier Wevers’ dance troupe has been consistently strong, presenting new and thought provoking dances. With “Choreographic Shindig III,” Whim W'Him has reached new heights. Bravo. Simply, bravo.